This piece of BudBrute or Bud x Brute fanart, which is my final piece of work for KatyGorl’s Claim a PPG Pairing Month from September, is dedicated to Mercy Prince aka Haccoon, Kattajellie aka Thescarletsail, Ixshel aka bubbles213, and MariaDeFatimaツ aka Jasmine23Gril who celebrated their birthdays several days ago. So, Mercy, Kattajellie, Ixshel, Maria, I hope you guys had amazing, thrilling, wonderful, and elegant birthdays. I wish you so much love, joy, and euphoria in your lives as artists. Yeah, you guys are absolutely seeing this. I freaking love Bud Smith together with Brute of the Powerpunk Girls as a couple. 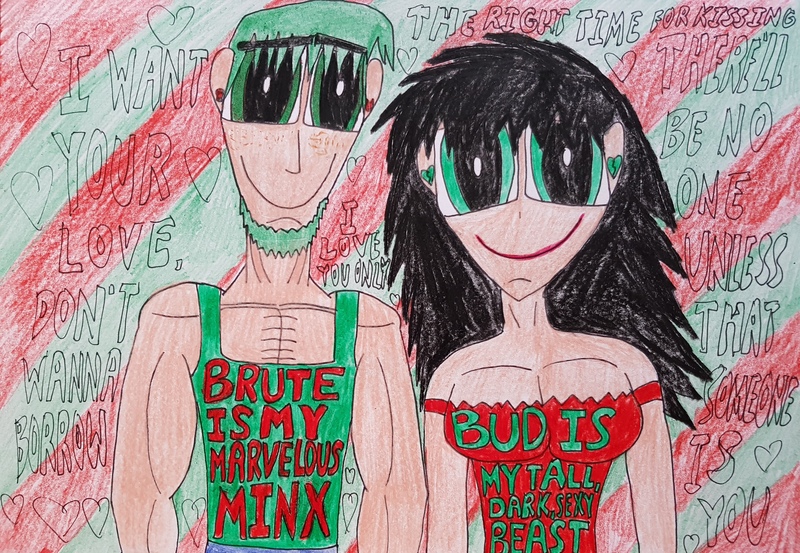 There is something so wonderfully charming about a moody, hardass guy like Bud pair up with a rough, wild-hearted, fiery young lady like Brute. I know these two can totally gel together. Moreover, it is a love-hate relationship to happen between a normie and a Powerpunk Girl, which makes this pairing all the more enjoyable. As my final song for this spicy couple, I decided to pick Love Me Or Leave Me sung by Nina Simone. I swear this has been an earworm for quite some time all thanks to the lively, jazzy rhythm, which I think fits well with this couple. I hope you also enjoy Nina Simone’s virtuosic piano-playing combined with her exceptional vocal work. I hope you all enjoy this classic Nina Simone song as well as this piece of Bud x Brute fanart. KatyGorl’s Claim a PPG Month was definitely fun even though real life and other priorities got in the way, but that is how it is. It was still so fun to have participated and I will always treasure the PPG couples I ship so much. Bud Smith and Brute from The Powerpuff Girls belong to Craig McCracken and Cartoon Network.